On Arrow Season 2 Episode 17 Frank Bertinelli is arrested and everyone prepares for the return of The Huntress. Laurel is offered the opportunity to prosecute Bertinelli and can't help but accept the offer. This means Sara is concerned for her sister's safety and wants blood if things get nasty. Oliver has other plans for his ex Helena's return and it causes some tight moments on Team Arrow. When Helena finally does return, it's not at all as expected and things go awry quickly. 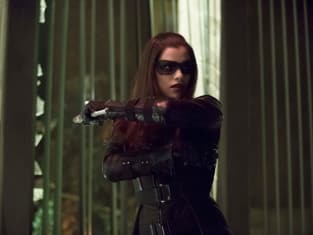 Felicity and Diggle think taking down the Huntress would be great. Oliver has a chat with Roy about his aggression issues and tries to talk him into breaking up with Thea. Since it's the only thing holding Roy together, will he take the chance? After a lot of girl-on-girl action. there is a stunning development in the last few minutes of the hour you cannot miss. Hurry and watch Arrow online right now!